Hello my friends, and welcome to this week’s Prayers for the week post! It’s been a really busy week, with a lot going on, so I’m going to forgo my introduction and get straight to what really matters — the prayer requests and praises that we need to pray about! As always, if you have any prayers or praises that you want us to lift up, please leave them as a comment, so that we can pray for you! First up is a prayer request for my Brother-in-Christ Keith. Please pray for my Brother Keith and his Mom, Georgia. She suffered a stroke a couple of months ago, and is recovering nicely, but still needs some more rehab. Please pray for her continued healing in the days to come. Thanks! Lord, please also take care of your servants Meleney, her fiance Daniel, and all of their family and friends. Daniel, in particular, is having difficulty facing life without Meleney, please give him all of Your Peace, Strength, and Mercy in the days ahead. Lord, also lift up Your Daughter Meleney; if it’s in Your Will, You will heal her, but if that is not to be, please supply her with an unending supply of your Comfort and Mercy.It is in the name of Your Son Jesus that we pray with Thanksgiving. Amen! Please pray for my friend Beth as she prepares to undergo some outpatient surgery on August 29th. At this point they don’t think it is anything major, but please lift her up. She is a great person, a Sister-in-Christ, and knows that God will look after her and her team of doctors. However, anxiety can be hard to overcome at times, so please pray along with me:Lord, please look after your servant Beth in the days leading up to (and during) her procedure. You know what is wrong with her, and we trust You to take care of her. Please give her Your Peace and Comfort, and guide the hands of her doctors so that they can take care of her the best way possible. It is in the name of Your Son Jesus that we pray with thanksgiving. Amen! Please also pray for the people of Foley, Alabama, and especially the family and loved ones of Meleney Harris. Meleney passed away on August 13th after bravely fighting her battle, please pray along with me:Lord, we celebrate the life of Meleney today, whom You called home to be with You. We are excited for Meleney because we know that she no longer has any pain, any suffering; we know that Jesus is caring for her right now. However, Lord, there is a huge hole in their hearts where Meleney was. Please comfort Daniel and his family and friends as they go through their grieving process; please stay with them and remind them in Your gentle way that while Meleney’s body may have lost the fight, her soul lives on, both in Heaven and in the hearts of everyone that loved her. Please grant them Your Peace and give them the Strength they need in the days, weeks, and months ahead. Lord, thank You for touching the lives of so many people who didn’t know Meleney but still felt compelled to help her in any ways they could. Death is always hardest on those left behind, Lord, as you know, so please be with those that will miss her each any every day. It is in the name of Your Son Jesus that we pray with thanksgiving. Amen! Prayers for the family of my friend Heather. Her Aunt passed away last Monday, and her family needs healing in her passing. Please pray for God’s Peace to descend upon them, and that they find the comfort they need and strength to endure during this troubled time. Thanks everyone! Please also pray for the friend of one of my dear friends; she is battling breast cancer, had surgery this past week, but they found out the cancer has spread to her lymph nodes. Please pray healing prayers for her that her doctors were able to get rid of all the cancer cells. Lord, grant her Your Peace, Healing, and comfort during the days ahead, please! We ask this in the name of Your Son Jesus, in whose name we pray with thanksgiving. Amen! I heard that the husband of a friend sent her a text indicating that there may have been a suicide at his place of work; that someone jumped from the 4th story of the building he works in. Please be near them and may this be found to not be the case, Lord. Please teach each and every one of us that nothing is as important or critical that we should choose to end our life over it. It’s in Jesus’ name we pray. Amen. Please pray for my friend Bridget’s Grandma. Here is what she wrote on Facebook:Thank you to everyone for the prayers yesterday. Please continue to keep us in your prayers as my Gram has been diagnosed with cancer. As many of you know, next to my mom, my Gram is my rock. She is a woman of conviction, belief in family and has an extremely strong faith in God. I can only hope to be half of the woman that she is. Thank you all for your continued love and support for me, my family, and my Gram as we deal with this next step in our lives. 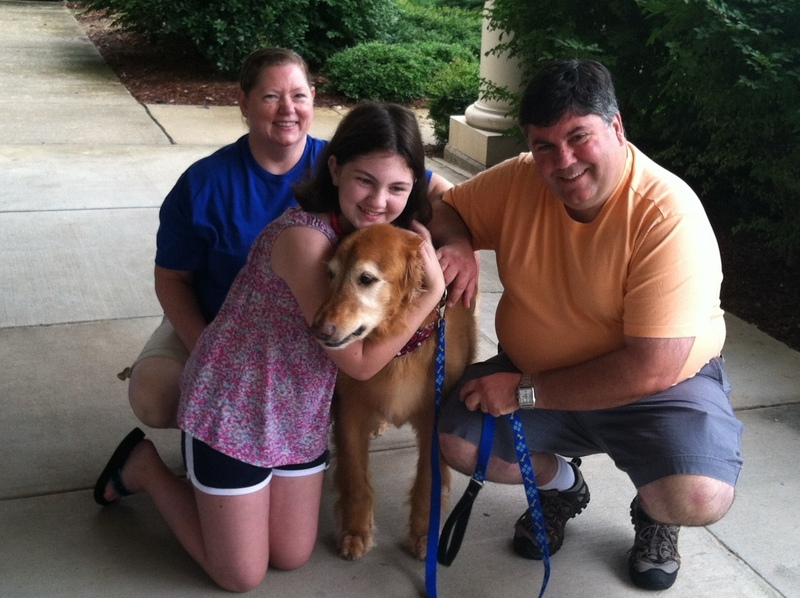 Special praise goes out to our foster family the Bailey family for taking great care of our new family member Regan! We adopted him yesterday, and spent a quiet day at the house. It rained quite a bit, but we were able to get in a couple of shorter walks between showers. In case you were interested, here is a family shot to see how happy we all are! I also want to give thanks to God for the wonderful dinner and fellowship that I enjoyed this past Tuesday at Edenton Street UMC. In addition, I got to hear some incredible testimonies from three of my Brothers, including one of my best friends, Doug, about what attending Bible Study has meant to each of them. The Men’s Study starts back up on September 10, 2013, if you are interested in signing up for it, click on this link to register! Remember, my friends, leave your prayer requests here and we’ll pray for you. Thank you so much for praying for these prayer requests! It means a great deal to all of us that you do this! Until next week, may God keep you and Bless you, may He take care of any concerns you have, and may you live each day remembering all the blessings that God has given you! Please say a prayer for me. I have Parkinsonism now I was told I have a deep Brain tumor. Tomorrow I will be seeing my Neurogist and a Brain Surgeon . I just wanted to let you know how much I enjoy reading your prayers every week. While I read your prayers, I say my own prayers for family, friends, and people in my community. God Bless!! Thank you Stephanie! Please keep coming back each week to say your prayers and pray for those that we have here. If there are any prayer requests you need us to lift up for you, please let me know. God Bless you too! Previous Post: Magical Blogorail – Favorite Character Dining!